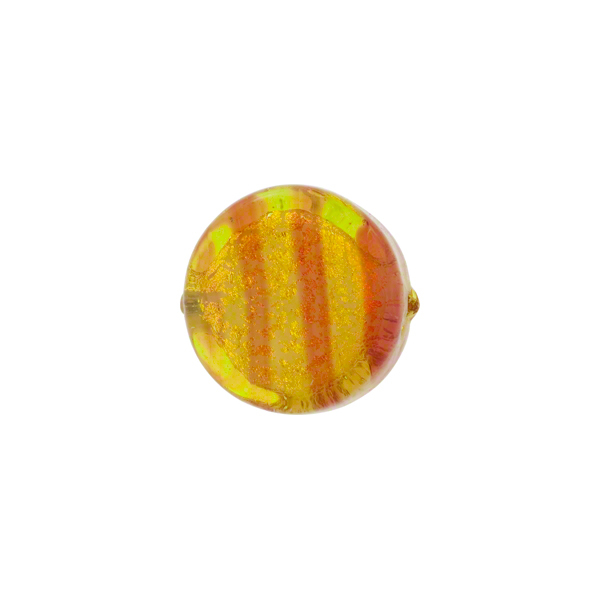 Venetian Glass Bead in the Missioni design Coin (disc sharp sides) approximately 12mm in diameter and about 5-6mm thick with a 1mm hole through the center. It is in the incalmo style, that is a base of translucent Moretti glass and 24kt gold foil with an overlay of striping and a outside covering of a transparent Moretti glass. This gives a very soft effect to the bead. The color is peridot green with rubino Murano Glass.